The DreamStation Pro for Grass Valley EDIUS Pro is our 9th generation of our post production Intel Core i9 video editing computer workstation for video editing, compositing and post production using Grass Valley EDIUS Pro 9 for 2019 and beyond. There is only one logical choice for the 7th generation Intel Kaby Lake CPU class for a video editing workstation, and that is the Intel Core i7 7700K. The Kaby Lake Core i7 7700K offers an 8MB cache, 4.2GHz clock speed, 8 logical cores with hyper-threading, and Intel HD 630 GPU technology from Intel. While there are other CPUs in this family, the price difference is very small. The Intel HD 630 provides a respectable GPU that is supported by all major software makers. If your needs demand it, you can add a AMD/nVIDIA GPU down the road. Please note that the Kaby Lake chipset only supports (1) PCI-e x16 slot and one (1) PCI-e x4 slot. The Intel 630 HD GPU does not use PCI-e lanes since it is a part of the CPU itself. If you plan on adding RAID-10 options, Thunderbolt, and a nVIDIA/AMD GPU then you should consider our DreamStation Extreme for Adobe CC. The new Z270 chipset brings support for 64GB of memory. This system uses a is based on a 'Dual channel' memory architecture optimized for use with the Z270 chipset and Core i7 7700K. This DreamStation now comes standard with a Solid State Drive (SSD) for a ‘System drive’ or your 'C: drive'. The ‘System Drive’ contains the Windows OS and your program files. Since your DreamStation is a multi-drive system, a smaller system drive is OK since you other drive volumes are used to store media assets and projects. For the ultimate performance, you can choose a m2. nVME Solid State drive. These SSD drives use a special slot on the motherboard and are smaller than a stick of RAM. 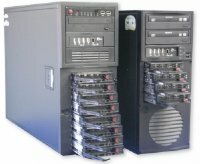 These drives offer a direct PCI-e connection for speeds up to 1500MBs read and write! If you are a serious power user for Premiere Pro, After Effects, or Photoshop then you should consider adding an SSD drive for your Media cache, scratch disks, and After Effects cache. The SSD drive will considerably speed up those applications, when working with complex projects but you may need to pay more attention to the size of those files andperiodicallydelete them. In this section you can pick your Display Adapter/GPU. This is the part of your system that connects your monitors and this component also plays a very important important role in your workstation. EDIUS PRO 8 does not take advantage of CUDA cores in the way that Adobe CC does. However, since this new processor supports Intel 'Quick Sync Video' technology, exports to H.264 are much faster than they are using the CPU alone. Support is planned in a future release for H.265/HVEC using this technology. The Intel 630HD Graphics option as the default GPU choice. The Intel 630HD option is a great choice for projects that don't involve a lot of filters, multiple layers, or raw 4K video editing and encoding. There is always an option to add a Graphics/GPU card down the road with this base system or have it installed in advance. For enhanced performance with Adobe CC programs like Ater Effects, you can select a nVIDIA GPU card for this system and still retain the. The nVIDIA GeForce GTX 1070 is the base card for a dedicated GPU. This card has 1920 CUDA cores, offers 8GB of 192-bit GDDR5 memory. The GTX 1080 offers 8GB of fast GGDR5x10 memory and 2560 CUDA Cores. For this system, we also offer the nVIDIA Quadro M4000 card as solution for customers who want compatibility with AVID Media Composer. The Quadro M4000 has 8GB of GDDR5 and supports (4) 4K monitors through (4) DisplayPort connections. Due to the PCI-e limitations of this platform, if you are planning on adding 4K IO cards, etc, it makes sense to take a look at our Intel X99 based DreamStation Extreme for EDIUS PRO. EDIUS Pro 8 is the perfect finishing tool for professional productions, including documentary and 4K theatrical productions. With more creative options and real-time, no-render editing of all popular SD, HD and even 4K formats, EDIUS Pro 8 is the most versatile and fastest nonlinear editing software available. EDIUS Pro 8 comes with GV Browser source management to prepare content for subsequent editing in EDIUS. EDIUS Workgroup 8 for broadcast users provides all the features of EDIUS Pro 8 plus broadcast-specific features with options for GV STRATUS and K2 integration, to streamline your time to air. In this section, you can choose an I/O device for your EDIUS workstation. For an internal solution, the STORM PRO offers HD-SDI input and output as well as a HDMI output. Purchase the STORM PRO WITH BAY and get Analog component, S-video, and composite inputs and output as well as analog audio input and output. The STORM Mobile offers an external box that sits on your desk making cabling easier. The STORM 3G ELITE is an external box that offers a multitude of input and output options. For an external solution we, we offer two choices. The first choice is theÂ Black Magic Design UltraStudio 4K. This box is housed in a small 1U rack-mountable chassis and offers a wide variety of SDI and analog inputs/outputs. The Black Magic Design UltraStudio 4K requires the Thunderbolt card found the connectivity category further down the page. The next choice is the Black Magic Design UltraStudio 4K Extreme. This extremely versatile box is housed in a 4U rack-mountable chassis and offers the most connectivity of any product in it's class. Connection to your DreamStation is accomplished with Thunderbolt or the included PCI-e card. Click on the MORE DETAILS links to learn more about each model of the Grass Valley and Black Magic hardware. We now recommend Windows 10 Pro 64 bit for all of our NLE systems. Windows 10 Pro has proven to be very stable and much faster than Windows 7 since it's release in 2015. All of the major software makers now support Windows 10 including Adobe CC 2015-2017, AVID Media Composer 8.3 and higher, Grass Valley EDIUS, Magix Vegas Pro, Davinci Resolve, and most plug in makers. As part of your install, we turn off the annoying parts of Windows 10. You won't get suggestions for the latest game and we can control the Windows updates. Windows 10 is required for this system because the new Intel Kaby Lake processors used in this workstation do not support Windows 7. If you require Windows 7, then check out our DreamStation Extreme for Adobe CC.